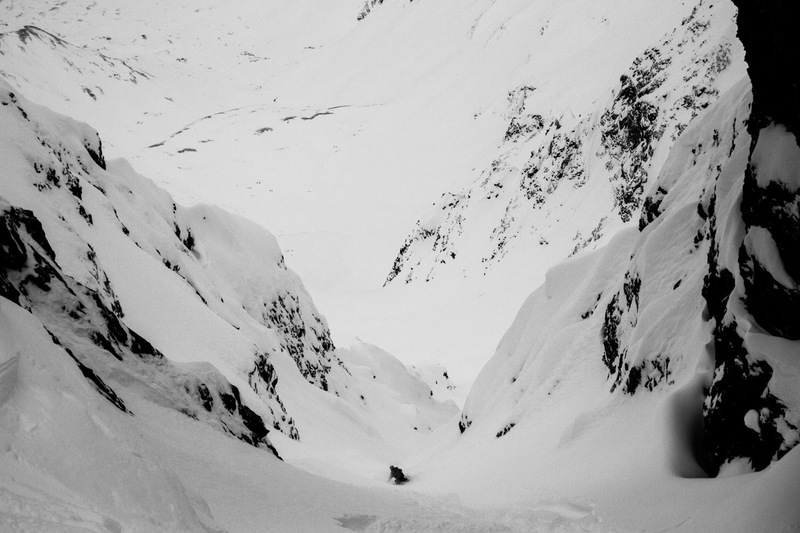 Eagle River is a land of huge peaks, deep couloirs, and a temperamental snowpack. Brady and Sarah entering the upper basin. Approaches are often long, access is tenuous, and snowpack information is limited. The views are one of many reasons to go. Recently I've heard report after report of good conditions in Hanging Valley. Brunton, Zack and Khalial, and Erin and Abe have all been back there lately. Plus, the approach and access are uncharacteristically easy for ER. Sarah taking it all in from the top of the first run. Harp in front of Foraker and Denali. On Sunday, with yet another storm flowing towards Turnagain, and wind affected snow at Hatcher, we went searching for contrast in the steep rock walls of Hanging Valley. At the bottom we regrouped and started another punishingly deep snow climb up the next coolie. The reward at the top, Eagle Peak, I can't wait to ski this one! Flute and Cantata to the southeast. Lots of adventure potential back there. I was definitely feeling it after two memorably deep snow climbs, but as Brady put it, he's "always up for more skiing". I guess I am too. Fortunately, we'd saved Erin and Abe's skin track for the last ascent. I needed it. Looking south thru the headwaters of Ship Creek and all the way to the Kenai Peninsula. If you look carefully you can see the power line cut above Indian. We watched Denali and Hunter turn gold, orange, and pink as the sun set on the Alaska Range.